Durban, South Africa (BWA) — In a statement at the closing plenary session of the 21st Baptist World Congress in South Africa on July 26, Baptist World Alliance (BWA) General Secretary Neville Callam renewed a call for the unity of the worldwide Baptist family. In the address, Callam called attention to the jubilant occasion in July 1905 when the original BWA constitution was agreed by the delegates at the inaugural Baptist World Congress. He drew attention to the emphasis the originators of the BWA placed on the organization as an expression of “the essential oneness in Christ” of Baptist churches worldwide. This was against the background of a perception of the worldwide Baptist witness as being weak and divided at the time. 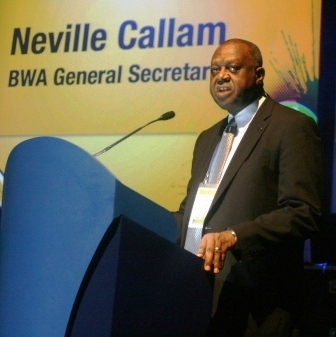 Callam said those who formed the BWA were keen to emphasize that the worldwide fellowship being formed was to signify or express the oneness in Christ of Baptist churches worldwide. “The BWA was to become a vehicle for both the expression of that oneness and the furtherance of Baptist unity,” he said. In a final appeal, Callam urged Baptists to commit to the core principles of the BWA, which are preaching the Good News of the kingdom, practicing responsible Christian discipleship, defending those who are persecuted and identifying with people in need not only by contributing to their relief, but also by working to remove the systems and structures that perpetuate injustice. The congress, which had as its theme, “Jesus Christ, the Door,” was held July 22 to 26 at the International Convention Center in Durban. It was the first Baptist World Congress in Africa since the first in London, England, in 1905. The 2020 celebration will, for the first time, combine the Baptist World Congress with the Baptist Youth World Conference. It will be held in Rio de Janeiro, Brazil. A fitting end to the Baptist World Alliance meetings being held in South Africa. Let us move forward together in Unity and spread the Gospel with a unified intent. God Bless.